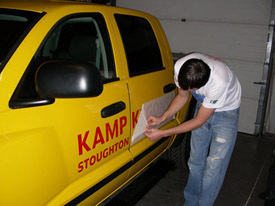 We custom cut vinyl lettering and graphics for vehicles, store windows and more. We can custom cut lettering in a wide variety of colors and fonts to match your needs. We also print graphics and contour cut them into most any shape or size. And, we can install our vinyl lettering or graphics year-round in our garage or in season at your location. Call us next time you need the best in vinyl graphics!